Yorkshire-based salad cress growers, W.S. Bentley, came to Leeds marketing agency, Pure, to develop a new brand and packaging design for its range of microgreens. With the product scheduled to launch nationally in Waitrose stores, the team had an exciting brief on their hands. 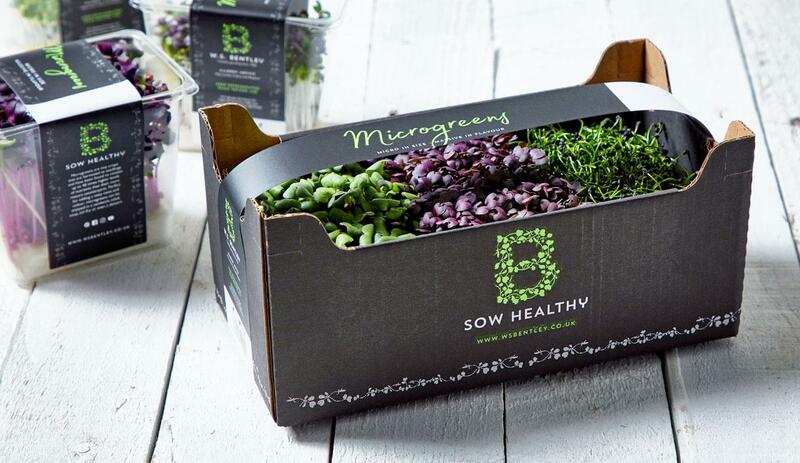 After developing the brand – B Sow Healthy – which provided a subtle nod to the ‘B’ within the company name, the health benefits of the product and the action of sowing seeds, the design team was ready to get started on the packaging. Two visuals were created, one for the microgreens triple pack and another for the individual punnets. The triple pack was developed to hold three varieties of the tiny crops, a mixture of either purple radish, garlic chives, red mustard, pink radish, rocket and mixed mustard. A black cardboard carrier was created with a vibrant green ‘B’ logo present on both sides. The inspiration for the logo was taken from the product itself, as tiny microgreen shoots were used to form the letter ‘B’. With a microgreens leaf pattern trimming the bottom of the box, the design was purposefully subtle and clean to reflect the nature of the delicate salad-based product. A strap was also developed to form a handle for the carrier box, marked with text in a script font, ‘Microgreens. Micro in size massive in flavour’. The individual punnets followed the same strap design in a reduced size. Alongside the branding and packaging project, Pure Agency’s web team created a blog-style recipe website for the new brand, to help change consumer perceptions of salad cress along with introducing new salad items that the W.S. Bentley team grows. Pure’s PR and Social Media team also launched and manages social channels, to share the recipes and encourage engagement. Take a look at the project to read more about it.